The compilation market is without doubt, one of the most competitive in the music industry. Every week hundreds of compilations are released by labels in America, Europe and Britain. Some are released by major labels, while others are lovingly curated compilations that are released by small independent labels. Many of these compilations concentrate on one type of music. This can be anything from progressive rock and psychedelia, to funk or fusion, throughout to blues, country, R&B, reggae and soul. Some record companies have taken to focusing on one of America’s great musical cities or states. Among the favourite cites for compilers have been Chicago, Detroit, L.A., Memphis, New York and Philly. Often though, some of America’s most musical cities and states were being overlooked. This included Louisiana. One man decided to rectify this, Ian Saddler. He’s a renowned expert in Louisiana’s rich musical heritage. This made Ian Saddler the perfect person to compile Boppin’ By The Bayou for Ace Records. It was released in 2012, and was so successful that another instalment in the series was commissioned. Boppin’ By The Bayou-Drive-Ins and Baby Dolls is the sixteenth volume in the series. Ian Saddler has dug deep for the twenty-eight tracks on Boppin’ By The Bayou-Drive-Ins and Baby Dolls. They’re taken from the vaults of some of Louisiana and South-East Texas’ best known producers. This includes some familiar faces, including J.D. Miller, Eddie Shuler, Sam Montel, Huey Meaux, and Joe Ruffino. That’s not forgetting Pappy Daily, George Khoury, Diamond Jim Wheeler and Melvin Dodge. In their vaults, Ian Saddler’s discovered what’s been described as: “hot rockers, cool boppers and Cajun thumpers.“ They come courtesy of a mixture of old friends, familiar faces and new names. Opening Boppin’ By The Bayou-Drive-Ins and Baby Dolls is Cookie Roberts’ Draggin The Drive-Inn’s. This Jack Rhodes composition was produced by Huey P. Meaux. It found its way onto the B-Side of Cookie Roberts’ single The Black House. When it was released on on Texas based Eric Records in August 1962, commercial success eluded Cookie Roberts and there was no followup. Later, when curious record collectors flipped over to the B-Side, they discovered Draggin The Drive-Inn’s which is rockabilly at its finest. By 1961, rockabilly singer Mickey Gilley was twenty-five. He had spent the last few years trying trying to make a breakthrough. However, hits eluded Mickey. Then in 1961, he teamed up with producer Huey P. Meaux. They would record a handful of singles together. 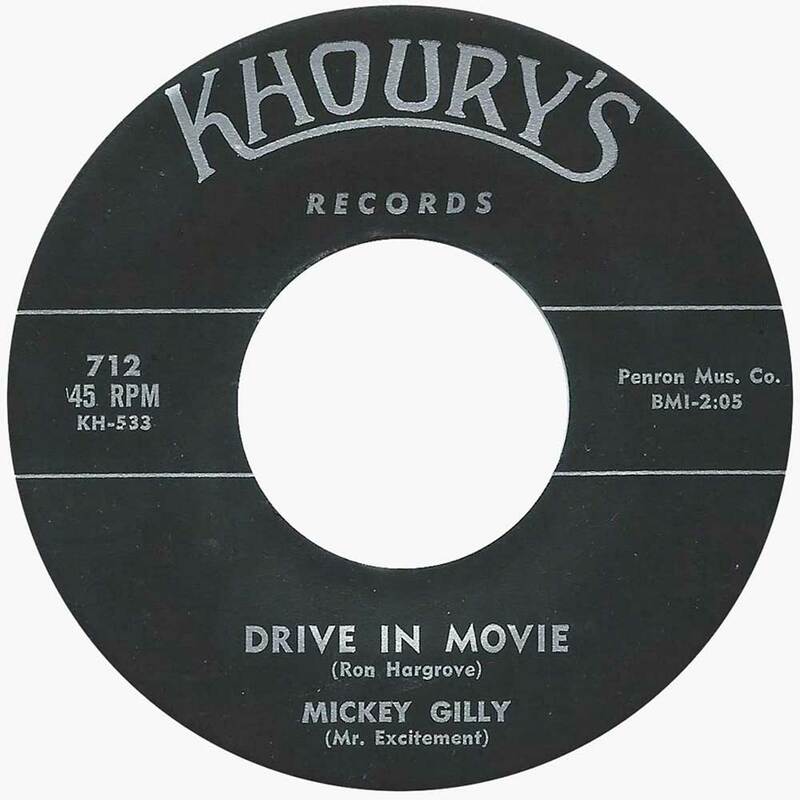 However, the Ron Hargrave penned Drive In Movie was a song that Mickey had recorded in 1959 with producer George Khoury. 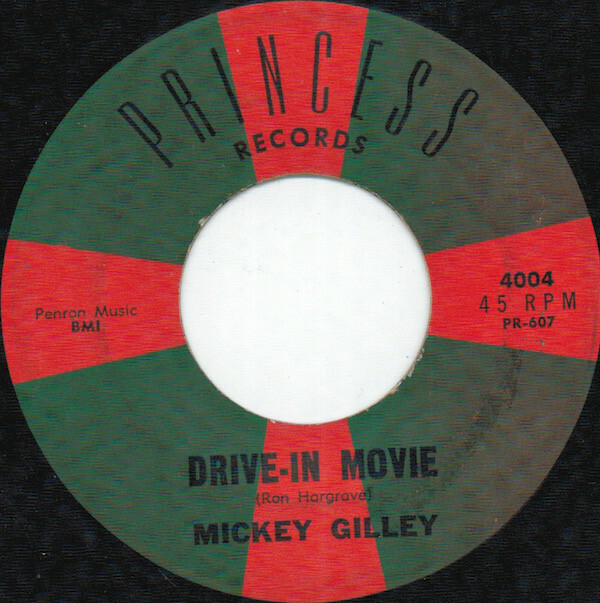 It was rereleased on Huey P. Meaux’s Princess label in December 1961. It’s a blistering slice of rockabilly, where stylistically, Mickey draws inspiration from Eddie Cochran’s Something Else. While the single wasn’t a huge success, Mickey Gilley went on to enjoy a long and successful career. Some artists feature on Boppin’ By The Bayou-Drive-Ins and Baby Dolls more than once. Terry Clement and The Tune Tones features three times. That’s fitting, as Terry Clement and The Tune Tones featured three brothers. Their first contribution is Rock Me Mama, which is a previously unreleased tracks that were also recorded with producer J.D. Miller. The other two songs Terry Clement and The Tune Tones recorded with producer J.D. Miller lay unreleased for two decades. She’s My Baby Doll was released on a Flyright Records’ compilation in 1980. It’s a raw and rocking stomper that falls into the category of hidden gem. Won’t Somebody Love Me is another quality cut that never saw the light of day until it featured on a Flyright Records’ compilation in 1980. That’s a great shame as it features Terry Clement and The Tune Tones at their best, as they combine emotion, energy and enthusiasm. From the opening bars of Burl Boykin’s 1960 single Let Me Come Your Way, he sounds uncannily like Elvis Presley. So much so, that when Burl Boykin took to the stage with his first group The Rockin’ Rebels, he was nicknamed Little Elvis. By 1960, Burl was a solo artist, and about to record Let Me Come Your Way at ACA Studios in Houston, with producer Pappy Daily. 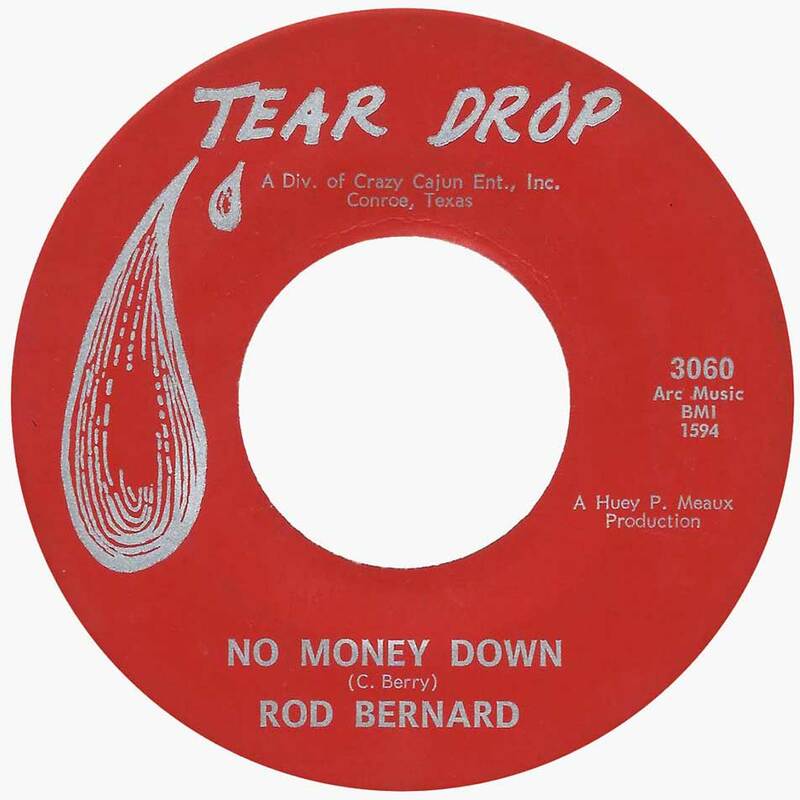 The single was released on Pappy Daily’s Texas based Clover label in 1960. Alas, it never came close to troubling the charts. Later, the talented Texan reinvented himself as a country singer, and enjoyed a lengthy career. Frankie Lowery, a veteran of four previous instalments of the By The Bayou series, makes a very welcome return, and features twice on Boppin’ By The Bayou-Drive-Ins and Baby Dolls. 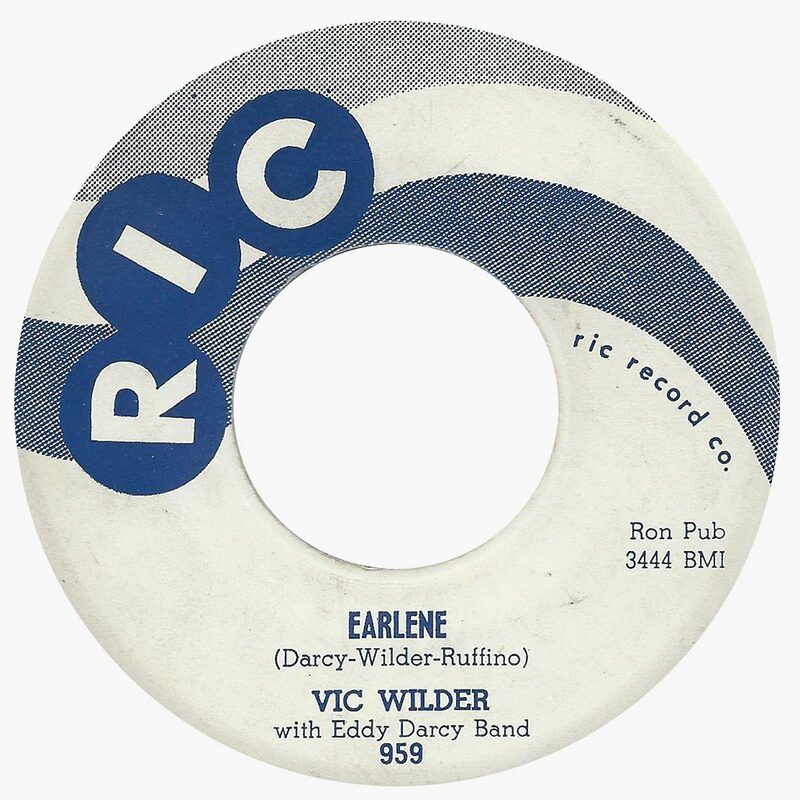 His first contribution is She’s Fine, which was released on Pappy Daily’s Dart label in 1961. Accompanied by a rasping saxophone, this catchy and memorable “cool bopper” is one of the highlights of the compilation. Very different is She’s Mine, a rockabilly song that Frankie Lowery recorded with producer J.D. Miller in the late-fifties. The band struggled with song for several takes, and this take is the best, and most complete version. Despite that, it was never released and is a welcome addition to the compilation. Another veteran of the By The Bayou series is Jay Chevalier. This time around, he records under his own name and as Jay Chevalier and The Long Shots. However, in 1961 Jay decided to become a pro ball player. This career change inspired him to release Mr. Football as a single on Montel in 1961. 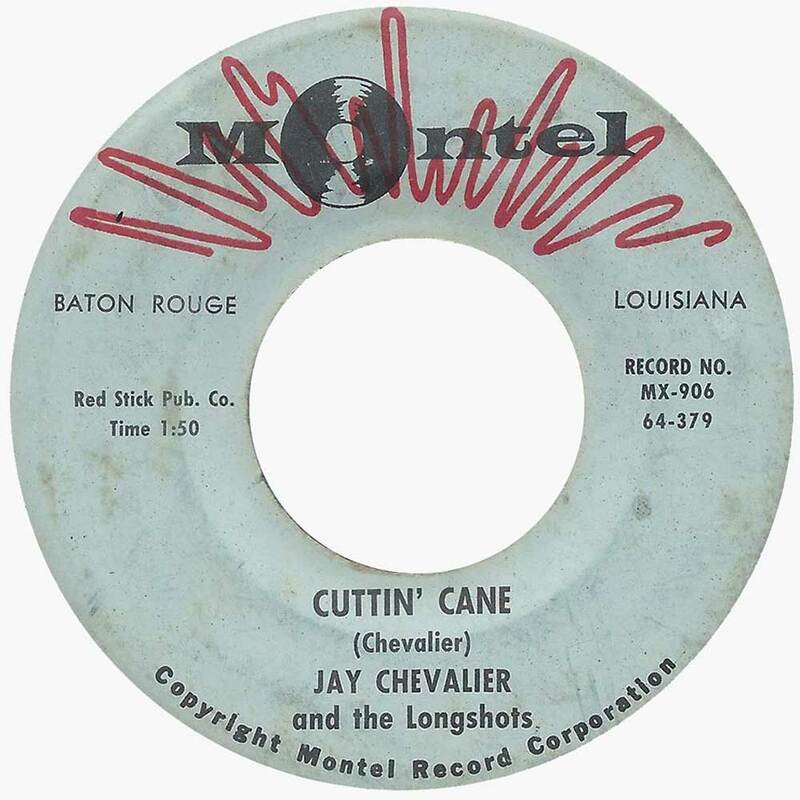 Tucked away on the B-Side was a rocking hidden gem Cuttin’ Cane, where Jay contemplates spending time in the infamous Angola prison. The singer turned ball player returns later in the compilation. Hey Joli was recorded by Terry Clement after he parted company with The Tune Tones. The accordion sets the scene, before Terry sings call and response with backing vocalists. They’re thought to be The Tune Tones, who play their part in the sound and success of a melodic and catchy song slice of Zydeco. It shows another side to Terry Clement and The Tune Tones. 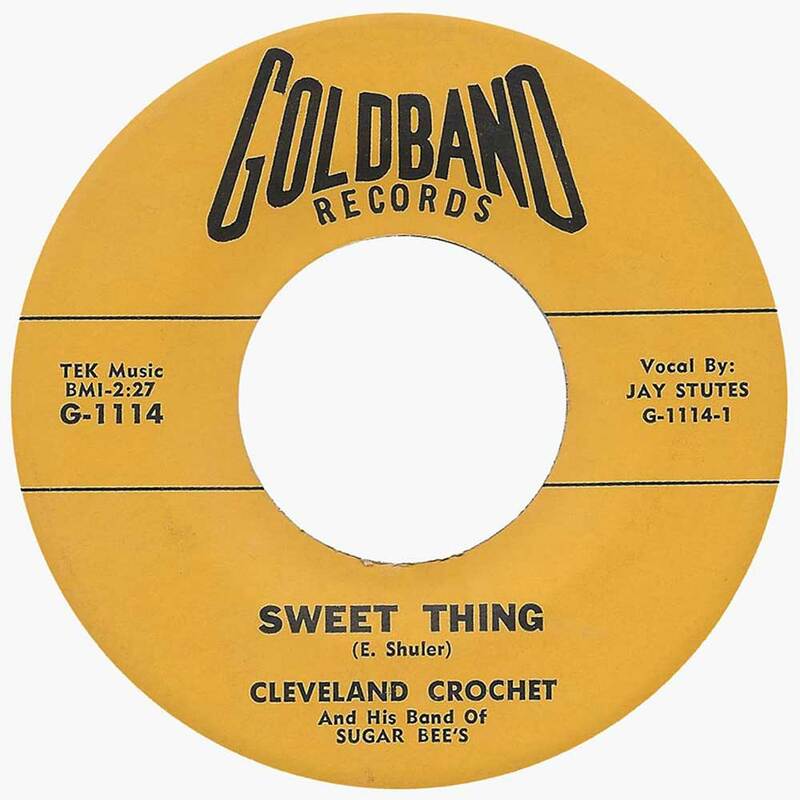 After leaving the Hillbilly Ramblers, Cleveland Crochet founded a new band, Cleveland Crochet and His Band Of Sugar Bees. They recorded first with with producer George Khoury, before moving to Eddie Shuler’s Goldband Records. That’s where they recorded the Eddie Shuler composition, Sweet Thing. It’s one of their finest moments, and features a vocal powerhouse from Jay Stutes, while the Sugar Bees respond to his call. Meanwhile, accordion helps power the arrangement along, as zydeco, blues and swamp pop combine. 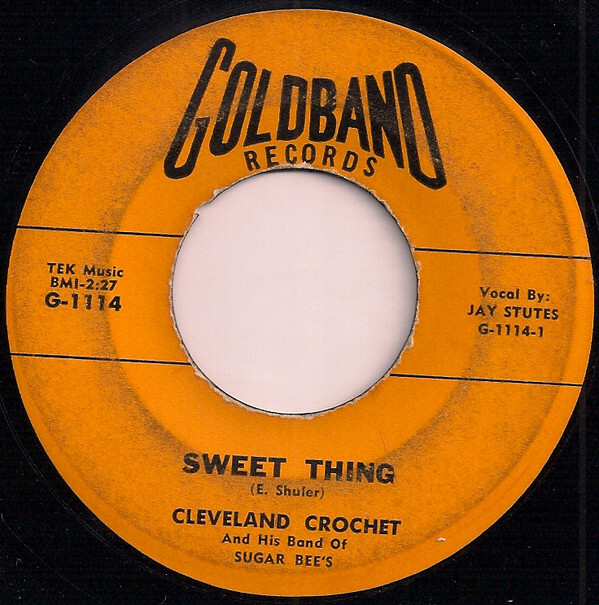 Alas, when Sweet Thing was released on Goldband in 1961, it never found the audience it deserved. Its addition to Boppin’ By The Bayou-Drive-Ins and Baby Dolls means that somewhat belatedly, Sweet Thing will be heard by a much wider audience. 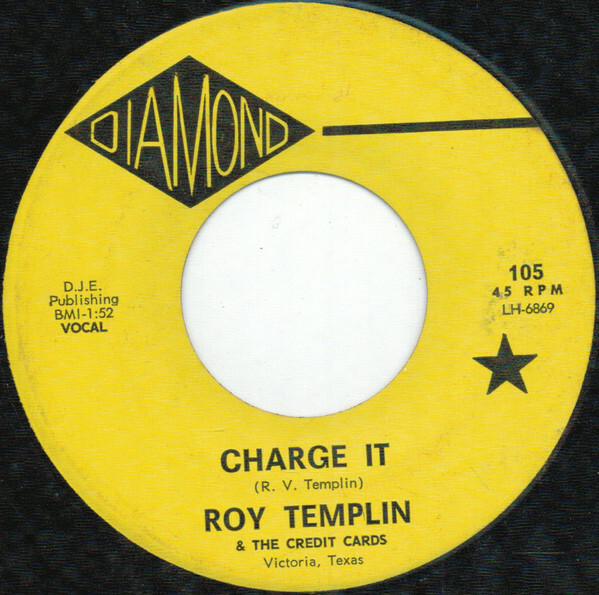 Roy Templin and The Credit Cards only ever released the one single, the aptly titled Charge It. It was written Roy Templin, and released on Bob Wheeler’s Houston based, Diamond Records. Charge It is an accomplished and catchy, novelty rocker. However, there was no followup, and Charge It was the only single released by the short-lived Roy Templin and The Credit Cards. There’s a number of previously unreleased tracks Boppin’ By The Bayou-Drive-Ins and Baby Dolls. Three of these best unreleased tracks were recorded by producer J.D. Miller. This includes hillbilly singer Johnny Bass’ Love Can Wait. It’s a real find, and falls into the category of long lost hidden gem. Wiley Jeffers cut several rockabilly songs, during his first session with J.D. Miller. Among them were a prime slice of rockabilly, You’re So Square. Another rockabilly singer is Tommy Todd, which was the alias of Clifford Pee Wee Trahan. His contribution is Prisoners Song, where the listener can hear the song the song take shape. It stops and starts, as J.D. Miller and Tommy Todd work on the song. It’s an interesting addition, and is a reminder of a prolific singer who recorded for various labels. In 1962, L.A. born Rod Bernard entered the studio with producer Huey P. Meaux. They were about to record a single. The song Rod had chosen to cover, was No Money Down. It was a favourite of Chuck Berry, and a staple of his sets. With Huey P. Meaux taking charge of production, No Money Down was recorded. Later in 1962, it was released on Huey P. Meaux’s Tear Drop label. Sadly, it failed commercially. Those that bought the single discovered what’s one of the finest covers of No Money Down. It’s bluesy and dramatic, with an arrangement that pays homage to Muddy Waters’ Hoochie Coochie Man. Closing Boppin’ By The Bayou-Drive-Ins and Baby Dolls is Jay Chevalier’s Khrushchev And The Devil. It’s a song Jay cowrote with Dee Marais. Bill Tester produced the single, which was released on the Cotton Town Jubilee label in 1962. This is one of several political boppers that were released around 1962 and 1963. However, what makes Khrushchev And The Devil stand out, is the piano break. It ensures that Khrushchev And The Devil is a cut above most political boppers. 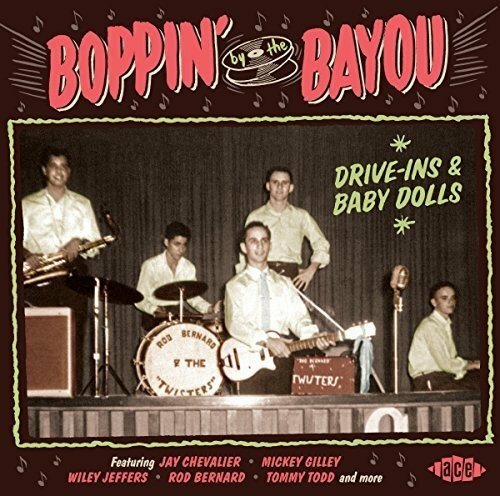 Boppin’ By The Bayou-Drive-Ins and Baby Dolls, which was recently released by Ace Records is a welcome addition to this successful series. It finds Ian Saddler digging deep, not just in Louisiana, but in South-East Texas. He’s found some hidden gems, which sit side-by-side with songs from old friends, familiar faces and new names. This includes singles, B-Sides and unreleased tracks. They’re part of compilation that’s all killer and no filler. 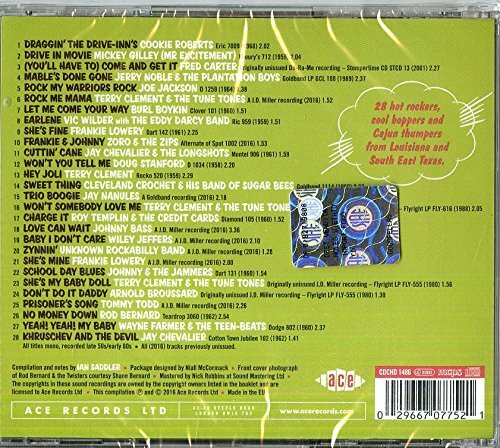 That takes some doing, as there’s twenty-eight tracks on Boppin’ By The Bayou-Drive-Ins and Baby Dolls. They range from “hot rockers, cool boppers and Cajun thumpers.“ This is a potent and heady brew. However, that’s been the case throughout the By The Bayou series. It’s now one of the longest running compilation series. Boppin’ By The Bayou-Drive-Ins and Baby Dolls is the sixteenth volume in the series. Still there’s no sign of the By The Bayou series running out of steam. That’s unlikely to happen, as Ian Saddler has a plentiful supply of music to choose from in Louisiana. This time round, Ian Saddler searched through the vaults of producers J.D. Miller, Eddie Shuler, Sam Montel, Huey Meaux, and Joe Ruffino. Ian Saddler dug deep into the vaults of Pappy Daily, George Khoury, Diamond Jim Wheeler and Melvin Dodge. All his hard work paid off, and he discovered songs by Cookie Roberts, Fred Carter, Joe Jackson, Burl Boykin, Frankie Lowery, Zoro and The Zips, Doug Stanford, Terry Clement and Johnny Bass. They’re joined by Arnold Broussard, Tommy Todd, Rod Bernard and Jay Chevalier. The result was a compilation that oozes quality, Boppin’ By The Bayou-Drive-Ins and Baby Dolls, which is very welcome addition to the By The Bayou series.